Dark circles under the eyes can be a major cosmetic concern for many people who very often have no idea that the problem can be either cured or significantly improved. The area around the eyes is crucial for interpersonal communication, for eye to eye contact. It also conveys important information about our state of health, fatigue, interest and emotions. How do we treat Dark circles around the eyes at The Beauty Clinic? 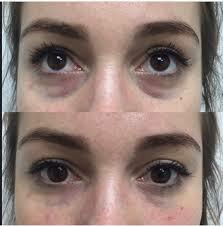 “Eye Boost” treatment using non- cross linked hyaluronic acid in a cocktail of nutrients to improve the hydration, skin structure and the fine lines as well as adding volume. This treatment one of our new treatments, delivered with precision to the area through our new vacuum mesotherapy device. Once corrected, your improved peri-orbital area, is relatively easy to maintain through yearly top up treatments. The improvement that the peri-orbital correction gives your appearance can not be under-estimated. While the list above may seem daunting, we wanted to bring to your attention the fact that the issue is complex and we are seriously assessing the problem with full knowledge of its complexity. However our patients know that our fundamental principle is to deliver the best treatment in the easiest and more affordable way. Please do not hesitate to call us should you require additional information or make an appointment for a comprehensive consultation with a member of our staff.